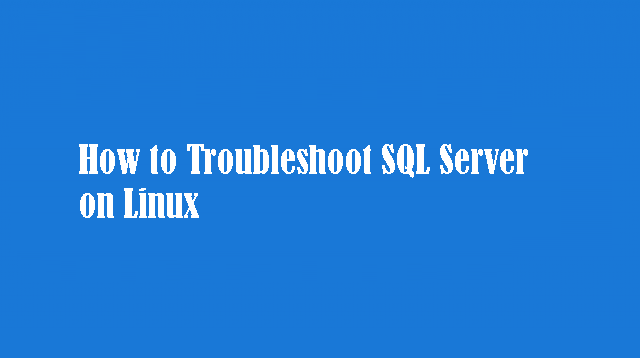 This article will walk you through the steps to troubleshoot Microsoft SQL Server running on Linux or in a Docker container. If you are having difficulty connecting to your Linux SQL Server, there are a few things to check. Verify that the server name or IP address is reachable from your client machine. sudo ip addr show eth0 | grep "inet"
If applicable, check that you have opened the SQL Server port (default 1433) on the firewall. For Azure VMs, check that you have a network security group rule for the default SQL Server port. Verify that the user name and password do not contain any typos or extra spaces or incorrect casing. Try to explicitly set the protocol and port number with the server name like the following: tcp:servername,1433. Network connectivity issues can also cause connection errors and timeouts. After verifying your connection information and network connectivity, try the connection again. The following sections show how to start, stop, restart, and check the status of the SQL Server service. If you have a running Docker container, you can execute commands within the container from a host terminal. Now you can run commands as though you are running them at the terminal inside the container. The SQL Server engine logs to the /var/opt/mssql/log/errorlog file in both the Linux and Docker installations. You need to be in ‘superuser’ mode to browse this directory. You can not connect to your remote SQL Server instance. Port 1433 conflicts when using the Docker image and SQL Server on Linux simultaneously. When trying to run the SQL Server Docker image in parallel to SQL Server running on Ubuntu, check for the port number that it is running under. If it tries to run on the same port number, it will throw the following error: “failed to create endpoint on network bridge. Error starting proxy: listen tcp 0.0.0.0:1433 bind: address already in use.” This can also happen when running two Docker containers under the same port number. ERROR: Hostname must be 15 characters or less. This is a known-issue that happens whenever the name of the machine that is trying to install the SQL Server Debian package is longer than 15 characters. There are currently no workarounds other than changing the name of the machine. One way to achieve this is by editing the hostname file and rebooting the machine. Resetting the system administration (SA) password. If you have forgotten the system administrator (SA) password or need to reset it for some other reason please follow these steps. Following these steps will stop the SQL Server service temporarily. Using special characters in password.